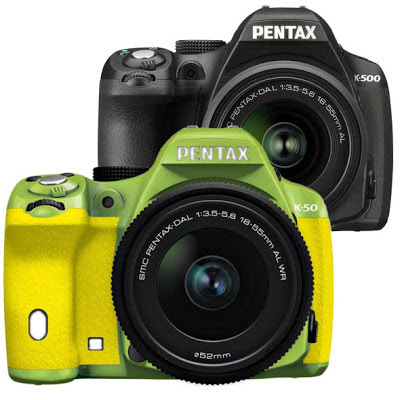 Pentax unveils its two new SLR cameras, the mid-range K50 and entry level K-500. The K-50 shares many features with its predecessor, the K-30, and comes with twin dial controls, a super-high ISO 51,200 sensitivity, and a 100% coverage glass prism viewfinder. The K-50 will be available in a wide range of colors for $699.95 for body only. The K-500 is a less expensive version of the K-50 that lacks the weather sealing and only comes in black. It is expected to hit stores in July and will cost $599.95 for body only. Also introduced today is the PENTAX K-500, an entry-level DSLR that augments PENTAX’s DSLR lineup by including advanced features uncommon to the entry-level class. Ideal for families and casual photographers with rigorous demands, the K-500 features a 16 megapixel APS-C CMOS image sensor, fast continuous shooting, high sensitivity shooting up to ISO 51200, 100% field of view, in-body shake reduction, and an advanced auto focus module. Operating on four AA batteries, the K-500 guarantees ultimate flexibility and accessibility to a power source when travelling or in remote locations. In addition, the K-500’s wide selection of simple user-modes and creative tools enable limitless personalized expressions while its intuitive ergonomics and menu layout make the K-500 approachable and comfortable to use. Both the K-50 and K-500 are built around PENTAX’s acclaimed K-mount system. Thanks to the lasting commitment PENTAX has made to the K-mount photographers are able to use any of the 25 million K-mount lenses that have been manufactured over the life of the mount. Access to this wide a selection is unparalleled and opens up many new perspectives for photographers encouraging boundless creativity. The K-50 DSLR is available to order today in a choice of 120 color combinations at pentaximaging.com and retail outlets nationwide in July 2013 with a suggested retail price of $699.95 for body only, $779.95 for the kit including DA-L 18-55mm WR lens and $879.95 for the dual lens kit including the DA-L 18-55mm WR and DA-L 50-200mm WR lenses. The K-500 DSLR will be available at retail outlets nationwide and online in July 2013 with a suggested retail price of $599.95 for the kit including the DA-L 18-55mm lens and $699.95 for the dual lens kit including the DA-L 18-55mm and DA-L 50-200mm lenses. Additional information including product specifications is available here: www.pentaximaging.com/news and product images are available here: www.pentaximaging.com/press/pressfiles.html.